Best iced coffee recipe: cold brewing with mint is the best method. 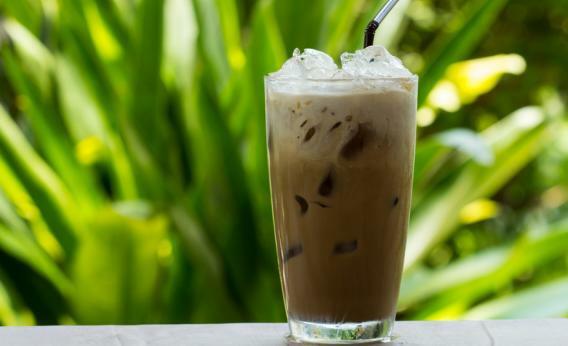 Are you ready to have your life changed by the best iced coffee recipe ever? Dear readers, I have a confession. I was doing iced coffee wrong. During these asphalt-melting days of summer, the last thing I wanted to do was start my morning off with a steamy cup of joe. Rather than pay a coffee-shop premium for the privilege of drinking a nice cold one on ice, I tried making some brews at home. But my efforts were largely disappointing: too bitter, too weak, and just generally not as good as I could buy retail. I researched methods online, but found that most recipes were similar to what I was already trying. And I’d already been dissatisfied with standard overnight cold-brew instructions and typical pour-over ice techniques. That’s when I reached out to John Hamanchosi, a consultant at Oven Hot Food Group, partner at 7 Coffee Roasting Co., and an eight-year veteran of the New York City coffee scene. A mutual friend told me he had a killer iced coffee recipe, and I was ready for some professional help. Then he dazzled me with a secret ingredient I’d never even begun to consider: mint. A few sprigs of mint bring out the light notes that are particularly refreshing in iced coffee, he claimed. Coffee and mint are two flavors I never would have put together, so I was eager to try this revolutionary approach. And it worked. His recipe was so far superior to anything I’ve tried that I’m never ever going back. The coffee was strong, flavorful, and much more rich and complex than my previous attempts. The mint works wonders: It’s not at all overpowering, but it gives the beverage a wonderful fruity and fresh flavor that you probably wouldn’t even identify as mint (at least not right away) if you didn’t know it was in there. You’d just know it was better than your average brew. 2. Place in medium bowl and pour 16 ounces of room temperature water over your coffee bundle. Cover with plastic wrap and let steep for 16 to 18 hours. 3. After steeping, remove the coffee bundle and squeeze excess liquid into the bowl before you discard it. (It’s also possible to use these same ingredients in a French press; I prefer the cheesecloth method.) Pour the coffee liquid through a coffee filter (a pour-over setup is ideal for this) and into a medium-sized jar or small pitcher. This removes any excess grounds or sludge that may have accumulated. Give the filter a few squeezes if it’s particularly slow to drip through. 4. Once the coffee has been filtered, you should have about 8 ounces of liquid. Add 12 ounces of cold water (you can add more or less to taste) and stir. Pour into two glasses with ice and enjoy with your favorite milk and/or sweetener. Pro tip: If you are a 9-to-5-er like me, start steeping this first thing in the morning before you leave for work, let it sit for the 16 or so hours, and finish up with straining and mixing with water right before bed. You can stick your ready-to-pour over iced coffee in the fridge and it will be waiting for you the next morning.